• Why is Red Chocolate Elephants an important resource for children? I was sad and I wanted to say... I just wanted to talk to him and say, why? Why did you do this? But I couldn't, and then I just started crying with the rest of my family. My son really struggles with the fear of forgetting his dad, as he was only 5 when he passed away. 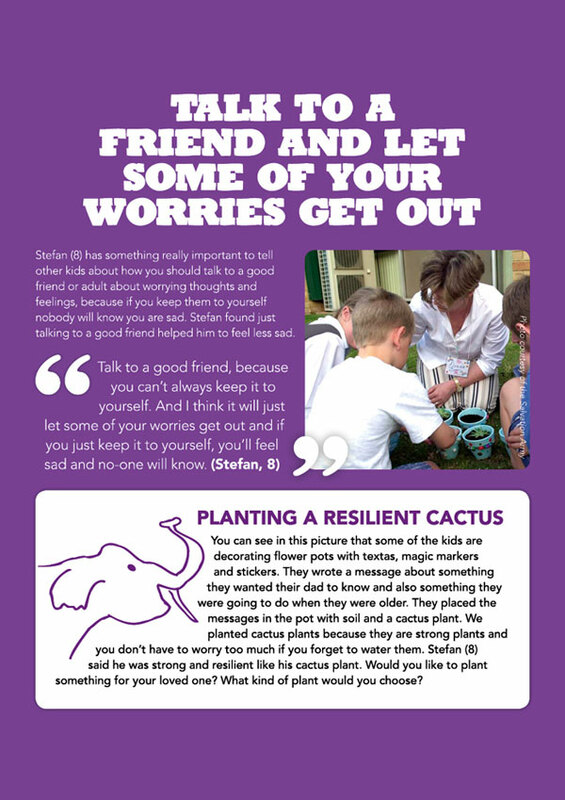 The activities in the Red Chocolate elephant book and words on the DVD from other children grieving the loss of a parent to suicide has helped my son immensely. The Red Chocolate Elephant book is an amazing resource and I will be doing all I can to make sure this resource becomes readily available within our community. 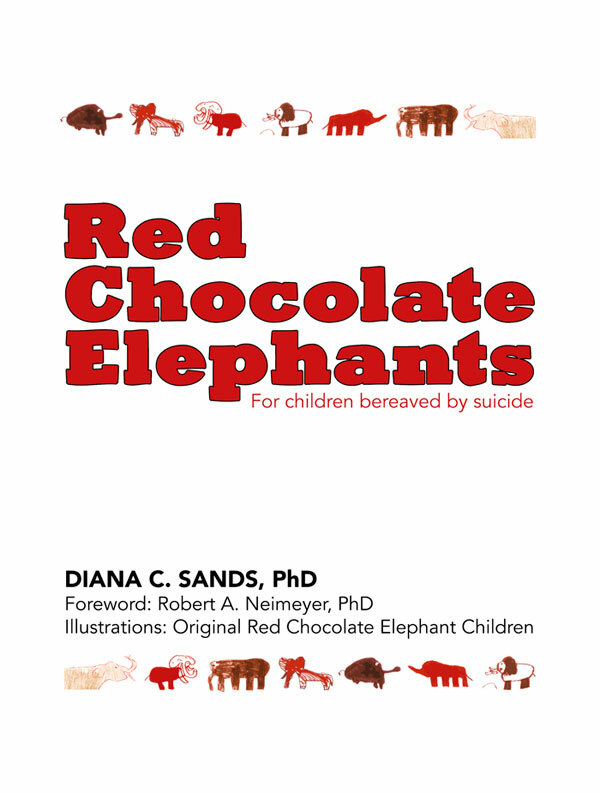 “The Red Chocolate Elephants is a remarkable resource for children bereaved by suicide. In a world where children are forgotten mourners, this unique combination of text, pictures, and voices - all in the words of bereaved children themselves - is a treasured safe haven for young people to hear their fears, questions, and difficulties put into works by other children just like them. The author Diana C. Sands, PhD, is the Director of the Bereaved by Suicide Service, Sydney, and has for over two decades provided community education, family counselling and group programs for adults, adolescents and children bereaved by suicide. Why is Red Chocolate Elephants an important resource for children? Many aspects of this kind of grief are confusing and don't make sense, and children need support in expressing these bewildering inconsistencies. The Red Chocolate Elephants provides a sensitive, age appropriate way of talking with primary school age children about the difficult questions of death through suicide. The unique combination of text, children’s words, drawings and voices allows children to hear their concerns and questions put into words by other children just like them, to support them in finding a way to express their own grief. The interactive activities assist identifying grief responses and provide opportunities for meaning making conversations to help reduce the sense of "I'm the only one this has happened to". These activities support development of a healthy bond with the deceased, strengthen resilience and build hope. How to use Red Chocolate Elephants? The book is designed as an assisted reading activity for an adult to read with a child, a few pages at a time while conversations are developed through the many activities set out with an elephant symbol. The book and DVD can be used in any order. Allow the child to be the guide for what is of interest. It would be useful to have drawing paper, coloured pencils, textas and other art materials ready for use. Children might like to have a book in which they write and draw their own story. 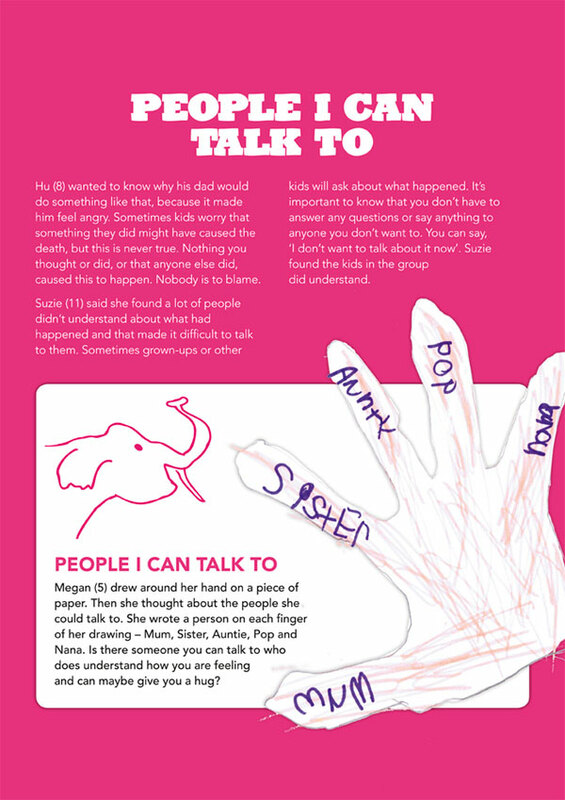 The book provides a range of interactive activities from drawing your own Feelings Bag to making a Talking Stick to help talking about really hard-to-say things, or drawing around your hand, and writing on each finger the name of a person you can reach out and talk with about worries and concerns. 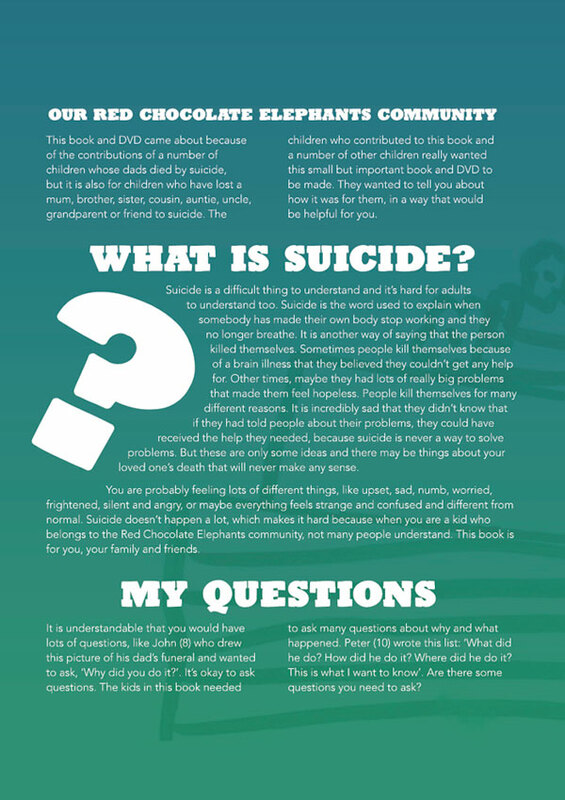 This important publication provides a sensitive and appropriate means of engaging with children around the difficult question of death through suicide. Red Chocolate Elephants will be a valuable tool for those supporting children in schools and other settings, and provides an important bridge into exploring this complex and confusing experience. I highly recommend it. Red Chocolate Elephants, with the directness of child-practical tips, and a caring therapist guidance, is an invaluable resource. I would have treasured this as a source of comfort after my mother died by suicide. 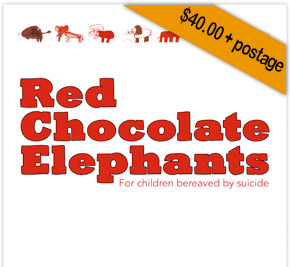 Red Chocolate Elephants provides a unique way of helping children, often forgotten mourners in suicide grief, cope with the loss of a loved one. No-one expresses it better than children and this is their opportunity to speak. The most important piece of all? Knowing their dads are still with them. This small book conveys a great deal of wisdom that will assist children as they sort out their feelings when someone they love dies by suicide. Red Chocolate Elephants is a most therapeutic gift. This poignant DVD and book is a welcome edition to the field of suicide literature. Listening to the voices of the children, we are reminded not just of how suicide affects them, but also of what we can learn about loss from them. Video: Dr. Sands talks on Open to Hope about helping children bereaved by suicide.